Carrier's AquaForce 30XW chillers provide a great combination of performance and compact footprint for cooling and heat recovery applications. These chillers provide excellent reliability and efficiency at true operating conditions without compromising the environment. Quality design and construction make the AquaForce 30XW chillers an excellent choice for modern, efficient chilled water plants. The 30XW chillers feature a compact footprint and are delivered as a single complete package less than 48 in. (1219 mm) wide for easy installation and minimal indoor space. The 30XW chiller footprints may be up to 30% smaller when compared to other chillers and may require less mechanical room floor space and smaller concrete pads. The AquaForce® 30XW screw chillers are shipped with starter and unit mounted flow switch installed and can be shipped with a full R-134a refrigerant charge to minimize installation time. The unit provides single point power connection (using optional control power transformer) and quick, easy piping connections (using Victaulic type clamp on couplings). The 30XW 200-v, 230-v, 460-v, and 575-v units are designed in accordance with UL (Underwriters Laboratory) and UL Canada standards to minimize electrical inspection time. Dual independent refrigerant circuits provide reliable, dependable cooling, excellent part load operation, and redundancy. Each circuit includes its own compressor, electronic expansion valve, filter drier, and sight glass to assure operation. The Aquaforce 30XW screw chiller efficiency levels meet or exceed energy efficiency requirements of ASHRAE (American Society of Heating, Ventilation and Air Conditioning Engineers) 90.1 2007 and CSA (Canadian Standards Association) for both full load and part load operation. The chiller is certified to AHRI standards. 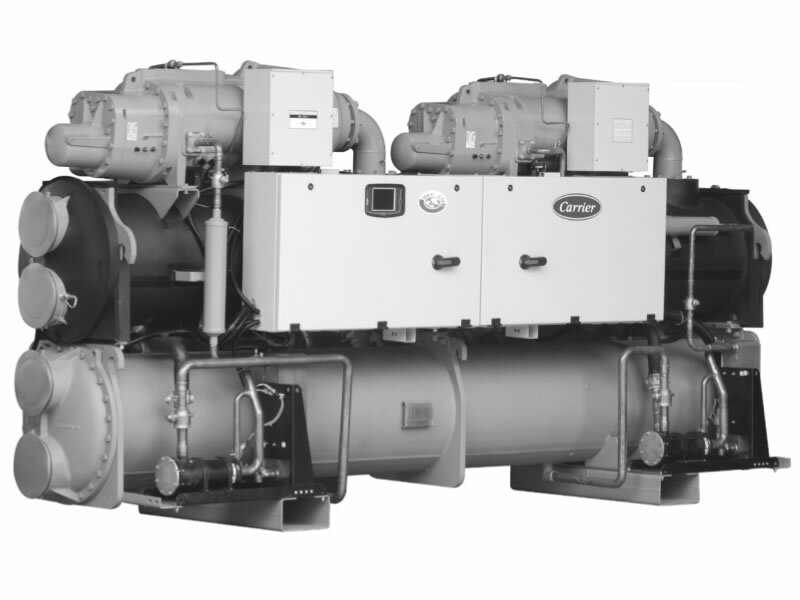 Per AHRI 550/590, chillers operate at design conditions less than one percent of the time. As a result, superior part load efficiency is required for today's chilled water applications. The 30XW chillers deliver integrated part load values (IPLV) as low as 0.468 kW per ton at AHRI conditions while offering the ability to operate in a broad range of applications and climates. This exceptional performance has a significant impact on energy savings and cost of ownership. The Aquaforce 30XW150-200 and 325-400 ton screw chillers provide up to 140 F (60 C) leaving condenser water (requires heat machine option) when applied in heat recovery applications. Further, the 30XW unit heat control mode can be utilized to maintain a constant leaving condenser water temperature. Low source controls provide evaporator suction protection to prevent nuisance trips when operating in heat recovery applications. This flexible capability allows a chiller to meet both cooling and heating requirements providing a high level of interchangeability within a chilled water plant. Carrier has long been committed to the environment and its sustainability. The Aquaforce 30XW screw chiller provides customers with a high-efficiency, chlorine free, long-term solution unaffected by refrigerant phase outs. Carrier's decision to utilize non-ozone depleting R-134a refrigerant provides customers with a safe and environmentally sound choice without compromising efficiency. In addition, R-134a refrigerant was given an A1 safety rating by ASHRAE, meaning that it is among the safest refrigerants available. Positive displacement compression ensures stable operation under all load conditions without the possibility of compressor surge. High-efficiency rotary twin screw compressors with infinitely variable slide valves allow the chillers to exactly match actual load conditions, delivering excellent part load performance. A quick start-up is assured once installation is complete, since each 30XW unit is manufactured at an ISO (International Organization for Standardization) 9001:2000 listed manufacturing facility to ensure quality. In addition, all 30XW units that are shipped with a full charge of R-134a refrigerant are tested under load at the factory to provide reliable start-up. Dual circuit units (sizes 325-400) stage the start-up of the compressors, thereby reducing the over all current draw by up to 40%. Aquaforce 30XW screw chillers are suitable for constant or variable evaporator flow. The Aquaforce 30XW chiller utilizes motors that are semi-hermetically sealed from the machine room. Refrigerant is used to cool the motor windings. • Compressor shaft seals that require maintenance and increase the likelihood of refrigerant leaks. • Machine room cooling requirements associated with air-cooled motors, which dissipate heat to the mechanical room. • High noise levels common with air cooled motors, which radiate noise to the machine room and adjacent areas. • Shaft alignment problems that occur with open-drive designs during startup and operation, when equipment temperature variations cause thermal expansion. Positive pressure designs eliminate the need for costly low pressure containment devices, reducing the initial cost of the system. The AquaForce® 30XW chiller's positive pressure design ensures that air, moisture and other performance degrading contaminants are not sucked inside the chiller. Purge units and their associated maintenance are no longer necessary. The optional refrigerant isolation valves enable service personnel to store the refrigerant charge in the evaporator or condenser during servicing. During servicing, the in-chiller storage reduces refrigerant loss and eliminates time-consuming transfer procedures. As a self-contained unit, the AquaForce 30XW chiller does not require additional remote storage systems. The optional suction service valve(s) allow for further isolation of the compressor from the evaporator vessel. The compact design allows for container shipment to export destinations, ensuring quality while reducing shipping cost. The Aquaforce 30XW chillers utilize mechanically cleanable shell and tube evaporators and condensers available with a complete line of water box options to meet project specific requirements. One, two, and three pass arrangements are available to meet a wide variety of flow conditions. Nozzle in head and marine water boxes are available to meet 150 psig (1034 kPa) and 300 psig (2068 kPa) piping requirements. ASME certified construction — An independent agency certifies the design, manufacture, and testing of all heat exchangers to American Society of Mechanical Engineers (ASME) standards, ensuring heat exchanger safety, reliability and long life. The ASME U-stamp is applied to the refrigerant side of the evaporator and condenser and is applied to the water side of these heat exchangers when 300 psig (2068 kPa) marine water boxes are provided. An electronic thermal dispersion flow switch is included with the evaporator. The switch is factory installed and tested and contains no moving parts for high reliability. Carrier's AquaForce chillers utilize advances in heat transfer technology providing compact, high-efficiency heat exchangers. Tubing with advanced internally and externally enhanced geometry improves chiller performance by reducing overall resistance to heat transfer while reducing fouling. Evaporator tube expansion at center support sheets prevents unwanted tube movement and vibration, thereby reducing the possibility of premature tube failure. Tube wall thickness is greater at the expansion location, support sheets, and end tube sheets, to provide maximum strength and long tube life. Support sheets prevent tube sagging and vibration, thereby increasing heat exchanger life. These valves allow filter replacement without pumping down the chiller, reducing service time and expense. The AquaForce 30XW screw chiller controls communicate in easy to understand English, making it as easy as possible to monitor and control each chiller while maintaining fluid temperatures. Controls are available with French, Portuguese and Spanish as standard configuration options. These controls result in higher chiller reliability, simplified training and correspondingly lower operational and maintenance costs. Two user interface options are available, the Touch Pilot™ display and the Navigator™ module. The Touch Pilot display is an easy to use touch screen display that provides simple navigation for configuration and control of the 30XW units. Carrier's exclusive handheld Navigator display provides convenience and powerful information in the palm of your hand. The Navigator display helps technicians to quickly diagnose problems and even prevent them from occurring. All 30XW units are ready to be used with Carrier Comfort Network® (CCN) devices. This function unloads the compressor whenever key safety limits are approached, increasing unit life. Reset can be accomplished manually or automatically from the building management system. For a given capacity, reset allows operation at reduced lift, saving energy when warmer chilled liquid can be used. This feature limits the power draw of the chiller during peak loading conditions. When incorporated into the CCN building automation system, a red line command holds chillers at their present capacity and prevents any other chillers from starting. If a load shed signal is received, the compressors are unloaded to avoid demand charges whenever possible. Ramp loading ensures smooth pull down of liquid loop temperature and prevents a rapid increase in compressor power consumption during the pull down period. The test can be executed prior to start-up to verify that the entire control system is functioning properly. This feature allows the operator to program a yearly schedule for each week, weekends, and holidays. Schedules can be programmed into the controller to ensure that the chiller operates when cooling is required and remains off when not needed by the tenants or process. Unauthorized access to the service menu can be password-protected. Built-in diagnostic capabilities assist in troubleshooting and recommend proper corrective action for pre-set alarms, resulting in greater up time. This file maintains the last 50 time and date-stamped alarm and alert messages in memory. This function reduces troubleshooting time and cost. Non-volatile memory provides protection during power failures and eliminates time consuming control reconfiguration.